Wayne Higby is an internationally renowned ceramic artist whose work is held in the permanent collections of numerous art museums around the world, including the Metropolitan Museum of Art, the Victoria and Albert Museum, the Museum of Modern Art, Tokyo and the National Art Museum of China. In addition to being the Director and Chief Curator of the Alfred Ceramic Art Museum, he is a professor and the Robert C. Turner Chair of Ceramic Art at Alfred University. Higby is a member of honor of the United States National Council on Education for the Ceramic Arts (NCECA), a Life Trustee of the Haystack Mountain School of Crafts, the Vice President Emeritus of the International Academy of Ceramics, Geneva, Switzerland and an honorary citizen of the “Porcelain City” of Jingdezhen, China. In 2014 the Smithsonian American Art Museum, Washington D.C. presented a retrospective of Higby’s work accompanied by the book Infinite Place: The Ceramic Art of Wayne Higby. Susan Kowalczyk is responsible for all aspects involving the museum’s collection including care and preservation, documentation, handling and movement, photography, loans and public interface. Susan was hired through a national search as the first registrar of the museum in 1996. During her tenure she has worn many hats and has facilitated or curated 36 exhibitions, produced 25 Ceramophile newsletters and three museum catalogs. She has held positions at the Rockwell Museum in Corning, New York and the Oklahoma Museum of Natural History at the University of Oklahoma. Her education includes a BFA from the New York State College of Ceramics at Alfred University and an MFA from Wichita State University. She has taught ceramics, design and foundations courses at the university level, managed a community ceramics studio and maintained a home studio and business. Her own work has been exhibited nationally. Bill Giese accepted the position as Operations and Programs Manager at the Alfred Ceramic Art Museum in 2019. Prior, he was the Museum Associate at the Alfred Ceramic Art Museum. Bill studied fine art at The College at Brockport State University of New York where he graduated with his BFA concentrating in sculpture. He moved back to Hornell after graduating from Brockport and currently resides there with his family where he continues to make, experiment and grow as an artist. Grant graduated in 2017 from Alfred University. He obtained two degrees, a Bachelor’s of Fine Arts and a Bachelor’s of Science in Art History. Originally from California, Grant is now a local resident of Alfred, NY. In addition to work at the Alfred Ceramic Art Museum, he assists local artists and continues to advance his own artistic practice. Shauna Fahley is a figurative sculptor, born and raised in King County, Washington. Shauna received her Bachelor of Fine Arts with an Emphasis in Ceramics from the University of Washington in 2017. In the fall of 2017, Shauna Fahley, Doug Jeck, Ben Jackel, Kelsey Duncan, Joe Freeman, and Christine Golden collaborated in a three-week residency at the PSZ Clay Center in Zanesville, Ohio. Shauna spent that following academic year studying as a Special Student at Penn State University while working as a studio assistant for Stacy Levy. She was also featured in the 2018 NCECA National Student Juried Exhibition. Currently, she is a Post-Baccalaureate in Ceramics at Alfred University. Theadora Frost was born and raised in Long Island, New York. She graduated with a Bachelor of Fine Arts Degree from Portland State University.Theadora’s work has been shown at Fourteen30, Grapefruits Artspace, Project 205, PSU Art+Design ScholarshipExhibition, Erickson Gallery, Autzen Gallery (Portland, OR),The Brooklyn (Paris, France) and Silas Marder Gallery (Bridgehampton, NY). She currently lives and maintains an art practice in Alfred, NY. 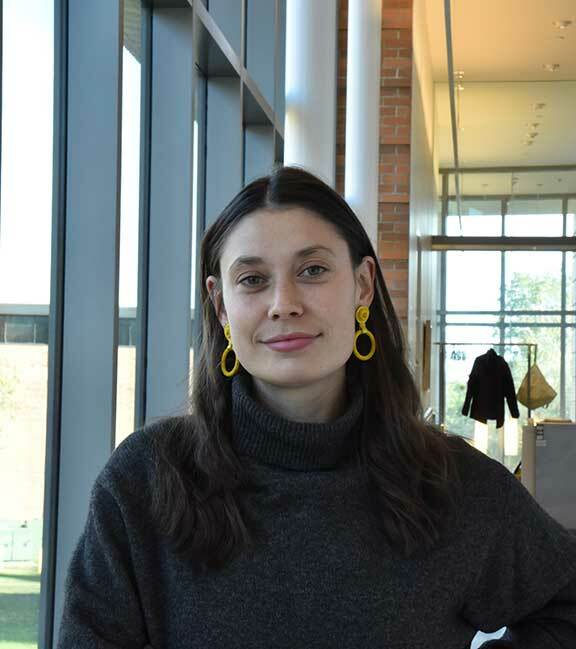 Natalie received a BFA from Alfred University in 2018. They are a multi-media artist focusing in Sculpture and Digital art.Natalie is from Pittsburgh Pa, but resides in Alfred NY, where they plan to continue making art.